Cleaning card technology allows for a thorough cleaning of transaction devices such as card and check readers, ATMs, and receipt printers without costly outside technical assistance. Used as preventive maintenance or to quickly correct device errors, these products remove dirt and other contaminants which can inhibit the device from functioning properly. 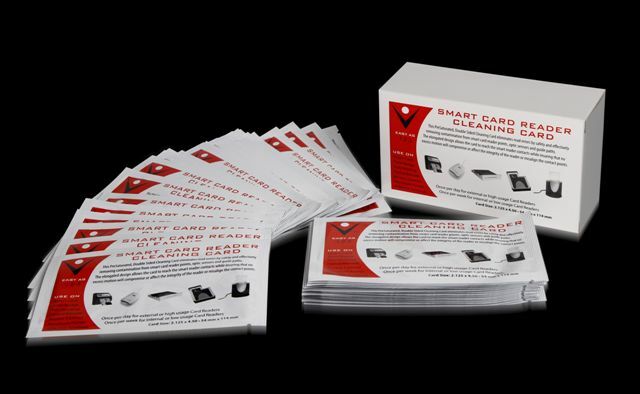 Smart Card Reader Cleaning Cards are designed to eliminate read errors by safely cleaning the contact point, read heads, optic sensors and guide paths for all Smart Card readers. The elongated design allows the card to reach the reader contacts without affecting point alignment. Check Scanners require a planned preventative Maintenance schedule to keep the units in optimum working order and prevent misreads. This Cleaning card removes contaminants from the feed path, magnetic head and roller surfaces. Thermal Cleaning Cards are designed to safely and effectively remove debris, dust, ink, adhesive residue and other contaminants from thermal print heads, paper guides and paper paths. This process improves print quality and legibility. The CR80, CR80 .010, and CR50 card cleans and revitalizes the transport roller and the roller path guide by safely removing dirt, magnetic oxides, oils and other contaminants. The .010 is specific to the Transportation/Parking Industry for Transit readers. The CR50 is specifically designed for Hotel Key Card Readers, that use a CR50 card size. Pre-saturated IPA Wipes are made to clean thermal print heads without leaving lint particles. Pre-saturated “alcohol free” Wet/Dry tandem wipes are safe to use on all screen types including laptops, touch, computer, IPod and IPhone. This foam tip cleaning swab have a pre-loaded foam tip containing a specific amount of IPA. MICR/Check Readers require a planned preventative maintenance schedule to reduce contaminants. This cleaning card is designed to keep currency/check handling equipment in optimum working order. The ATB Card thermal printer cleaning card has a unique design and size with a greater degree of opacity which enhances readability and performance. It is a vital tool in the airline industry for reading bar codes on airline tickets and baggage tags. Cashless Ticket and Receipt Printer Cleaning Cards are manufactured to remove paper flash from ticket and receipt paper paths. They also remove ink residue and dirt particles from the print heads. The Check Scanner Cleaning Kit allows for multiple cleanings with a choice of 2 specialized cleaning products. We believe that customers should raise the expectations they place on their Cleaning Card suppliers, and hold them to a higher standard. A higher standard of service, quality, and expertise.